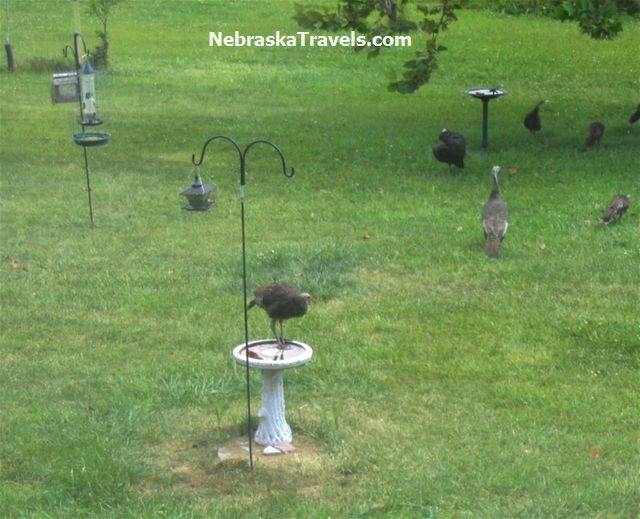 Now we have Videos of Wild Turkeys to go with the Deer in back yard Videos! Getting to be more and more Wild Turkeys wandering around Eastern Nebraska Rural Areas. Sometimes you will come upon a Flock of them during the daytime slowly crossing the road. Not quite as bad as the deer since turkeys roost at night and don't dart out in front of you or run at your headlights like deer do. Plus they wouldn't do nearly as much damage to your car as a deer if you happened to hit one! 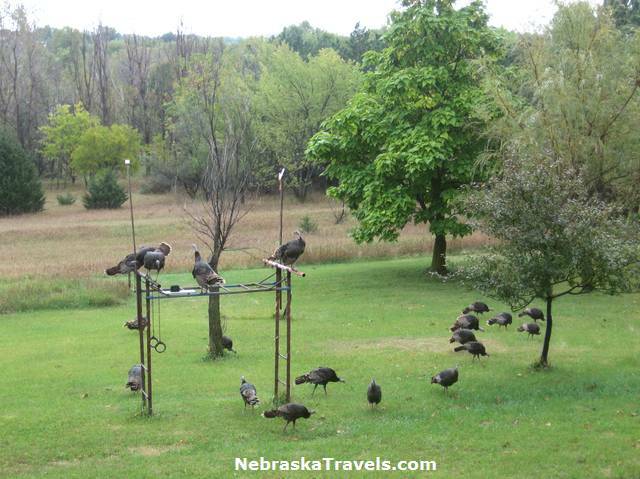 Hmmm -- wonder if they will still be around at Thanksgiving when they may have "fattened up" a bit! 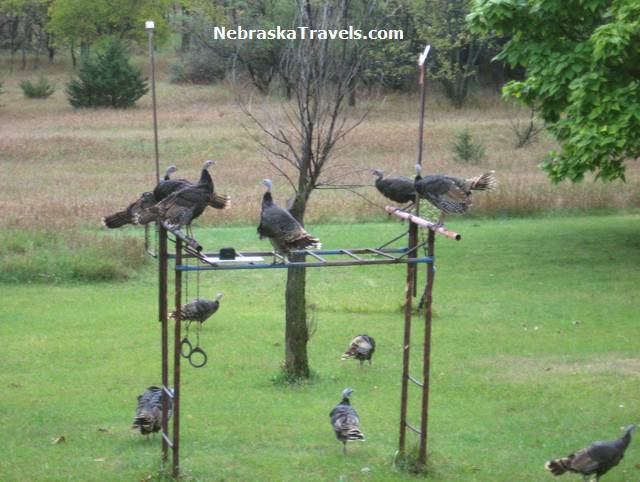 These wild turkey pictures and Video were taken in early October, 2007.
on the gym set. Also see Wild Turkey Video below. 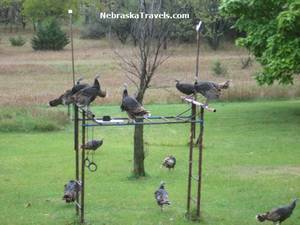 Wild Turkeys perched on gym set in Eastern Nebraska acreage back yard. A use for the gym set we never thought of! They pecked at my outside rain guage sensor but it still seems intact. of this BIG bird moving in on their territory? Video of Wild Turkeys flying up to perch on gym set in back yard. Some fly up to perch on gym set as they get to it. Vs the tree limbs the wild turkeys are used to perching on. Video + Pictures of Smith Falls Waterfall & Niobrara Rivers. Toadstool Geologic Park in the Chadron, NE "Badlands" area northwest of the Western Nebraska Sandhills -- plus Hiking Trail Info and Photo Gallery (High Resolution Photo Versions are now also available.) Now has a link to a Video of a Coal Train near the park - with train whistle sounds. Sandhill Crane Migration - Pictures, Viewing Location Tips, Crane Links, & Maps + Video of thousands of Cranes flying in to roost for the night on the Platte River at Sunset and their unusual sounds! See these High Resolution Photos Preview pages for over 80 popular non-watermarked high resolution photo downloads from all 3 of our "Picture Enhanced" US Vacation Sites. Includes Viewer stats. Free "Comp" downloads are available. Come back and watch our growth -- and check for our our new Nebraska Sandhills and other Nebraska Travels Attraction pictures and video clip postings! Info on your next Affordable Nebraska Travels -- or to check out our latest Picture additions! 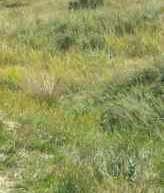 We always appreciate your suggestions, questions, or comments for this Site or any of our four US Vacation Web Sites. Use our easy Gene Seecann Sites Comment Form Page which also includes links to all of our Web Sites + Photos -- You can also share your own favorite Western Nebraska Travel Attractions or pictures. We appreciate your comments and feedback! We will not share, sell, or spam your email address -- Promise!!! -- we hate spam as much as you do! Looking for something specific that's not here yet? Search our other two US Vacation Guide sites.